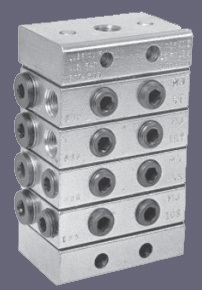 The MJ divider valves can have a minimum of three sections and up to eight sections. They operate at pressures up to 2000 PSI. They are designed to be used with oil or grease up to NLGI Grade 1. The discharge volume ranges from 0.005 to 0.030 cu.in.